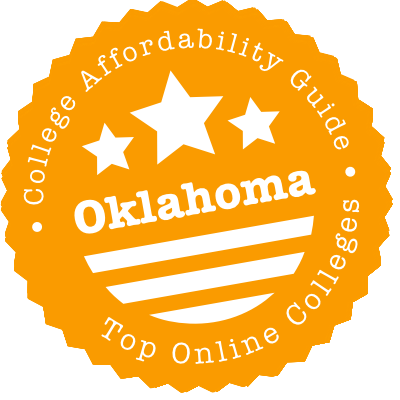 Scroll down to see the top not-for-profit colleges and universities in Oklahoma offering online degree programs. Students at Tulsa Community College can choose from more than a dozen associate degrees and eight certificates that are available 100 percent online. As with most community colleges, the offerings are a mix of university transfer programs and technical education for students in the workforce. Transfer degrees are available for students who plan to major in business, education, or the liberal arts. Technical programs include associate degrees and certificates in accounting, taxes, and early childhood development. TCC has transfer partnerships with more than a dozen regional schools, including the University of Arkansas at Little Rock, the University of Tulsa, and Oklahoma State University. Such partnerships help transferring students to get maximum credit for the courses they've taken. The University of Oklahoma's University Outreach program allows working adults to earn a graduate or undergraduate degree completely online. The College of Liberal Studies offers several online degrees, including programs that lead to a Bachelor of Arts in Administrative Leadership, Liberal Studies, Lifespan Care Administration, or World Cultural Studies, and a Bachelor of Science in Criminal Justice. Online undergraduate classes are offered in an accelerated, eight-week format. Students typically take two online courses in the first half of a semester and another two in the second half of the semester, completing four classes each semester, but some students take three classes each eight-week term to accelerate the time to their degree. Graduate degrees offered in a 100 percent online format are a Master of Arts in Administrative Leadership, M.A. in Human and Health Services Administration, M.A. in Museum Studies, Master of Prevention Science, and Master of Science in Criminal Justice. Classes at the graduate level follow a traditional semester calendar. Online students at all levels are assigned an adviser who helps them create an individualized graduation plan. All the programs offered by the College of Adult and Graduate Studies at Mid-American Christian University are delivered 100 percent online. These programs include both bachelor's and master's programs in fields such as business leadership, Christian ministries, and psychology and counseling. Some of the bachelor's programs are degree-completion programs, and MACU offers academic credit for prior learning, work experiences, and professional certifications to help students complete their degree faster. Online courses range in length from five to 10 weeks and are asynchronous so students have the flexibility to access course materials when it suits their schedule. Oklahoma State University Oklahoma City offers several programs that can be completed entirely though online coursework. Options range from certificate programs for child care providers to one bachelor's program, a Bachelor of Technology in Emergency Responder Administration. Many programs are Associate in Applied Science degrees, which are considered career degrees. Options include business, management, and surveying technology. Associate of Science degrees, for students who will transfer to a four-year school, including public service and health care administration. Law enforcement personnel in Oklahoma can earn a degree in police science online. Oklahoma State University's online division, called OCampus, offers two bachelor's degree completion programs and more than a dozen options for earning a master's degree online. The degree completion programs allow students who already have an associate degree to earn a Bachelor of Science in Business Administration or Electrical Engineering Technology. Master's degrees are offered in agriculture, agriculture education, business administration, MBA-telecommunications management, industrial engineering and management, electrical and computer engineering, engineering and technology management, entrepreneurship, gerontology, management information systems, telecommunications management, human environmental science with an option in family financial planning, and nutritional sciences with an option in dietetics. Classes delivered online typically allow students to watch a streaming video of recorded class lectures or otherwise attend class at the time of their choosing; content is delivered completely online. Some classes require proctored tests. The amount of time required to complete a degree varies by program and how many classes a student takes per semester. Oklahoma State University offers online students a distance-only fee waiver per credit hour and also grants a waiver for non-resident active duty military personnel that brings their tuition for online classes to nearly the in-state rate. Rose State Community College has seven associate degrees students can complete entirely online. Several are Associate in Arts or Associate in Science degrees for students who plan to transfer to a four-year school. The general studies, or liberal studies degree, for instance, covers the general education requirements needed for a variety of majors such as English, history, or math. The AA in Social Studies prepares students to major in any social science at the university level. Rose has transfer agreements with about a dozen colleges and universities that allow students to transfer without losing credits. Students interested in more immediate job skills can earn an associate degree in cybersecurity or library technical assistant online. Northeastern State University offers more than 400 courses online, including all the coursework needed for a student to complete a variety of bachelor's or master's degrees. All of the bachelor's degrees offered through NSU Online are geared toward students who have an associate degree or who have completed a substantial amount of college work previously. Programs are available for a Bachelor of Science in Nursing (open to working registered nurses), and bachelor's degrees in criminal justice, health care administration, hospitality and tourism management, medical laboratory sciences, organizational leadership, and supply chain management. Graduate degrees available include Master of Arts in American Studies, a flexible, interdisciplinary program that allows a candidate to create an individualized program focusing on cultural studies, history, or politics. The other two available online graduate degrees are a Master of Education in Reading and a Master of Education in Science Education. NSU also offers a variety of non-credit professional development programs and certificates that can be completed online or in a blended format that mixes online classwork with face-to-face meetings. At Southwestern Oklahoma University, three programs are offered in an online environment, which features coursework delivered online in an asynchronous format that allows students to log on at a time of their choosing to view course materials and participate in class discussion boards. The university also recently introduced a webinar delivery format, in which classes are delivered online but students are required to be online at a specific day and time to view live lectures and interact with classmates. Programs offered in the asynchronous format include a Bachelor of Science in Nursing degree-completion program for working nurses, a Bachelor of Science in Health Information Management, and a Master of Science in Health Care Informatics and Information Management. The 36-credit master's degree has a thesis option and a non-thesis option. The non-thesis option requires a capstone project and professional practice experience. The program that is delivered in the webinar format leads to a Master of Education in Educational Administration. Applicants to the program must have a valid teaching license and at least two years of experience as a classroom teacher. As part of the program, candidates must complete a principal internship. With Southeastern Oklahoma State University's historical role of educating teachers, it's no surprise that many of the online graduate programs at SOSU are also aimed at teachers. Educators can complete a master's degree online in specialties such as special education, educational leadership, and school counseling. The Master of Education in Curriculum and Instruction has five emphasis areas, including educational technology, math, and English. The online MBA program has a dozen available concentrations, including Native American leadership and aerospace logistics along with more common concentrations such as finance or marketing. The Master of Science in Occupational Health and Safety is online except for two labs that require students to be on campus for a weekend. The Center for eLearning and Customized Education (CeCE) at UCO offers several online classes in the following fields: Business & Career, Medical/Health Care, Personal Enrichment, Public & Environmental Safety, and Technology. CeCE also has law and legal certificate programs including a paralegal certificate course, a legal secretary certificate course and an advance legal research and writing certificate course. CeCE uses different eLearning tools in the creation and delivery of its online courses including SoftChalk cloud, Lectora and the Adobe Creative Cloud. Rogers State University has been a leader in online education in Oklahoma, where it was the first college to offer online classes back in 1992. Today, RSU offers a range of associate and bachelor's degree programs that are open only to residents of Oklahoma. Students can earn their entire bachelor's degree though online work, with no need at come to campus. RSU's online classes follow a traditional 16-week semester format and are offered in the spring, summer, and fall. Most of the classes are offered in an asynchronous format that allows students to do the work whenever they want. Associate degrees offered are Associate in Applied Science in Applied Technology, Associate of Science in Computer Science, and Associate of Arts in Business Administration. The Associate of Arts in Liberal Arts offers options in English or global humanities. Bachelor's degrees are available in liberal arts (English or global humanities), business administration, business information technology (software development and multimedia, or computer network administration), organizational leadership, or applied technology (renewable energy management). Online students have access to distance library services. East Central University offers four graduate programs that can be earned entirely online. The Master of Education with the Secondary Education-Educational Technology option is a 32-credit program that gives teachers skills in designing and implementing digital learning tools, and students also learn how to evaluate the effectiveness of these environments. The 32-credit Master of Education with the Secondary Education-Sports Administration focus is designed for teachers who want to work in positions such as athletic director or head coach in a school. The 32-credit library media program results in a Master of Education degree, and students who hold a valid Oklahoma teaching certificate can become a certified library media specialist at the end of the program by passing the state test. Teachers with a valid license and at least two years of teaching experience can enter the online program in educational leadership to gain the skills needed to be a K-12 administrator. All online programs follow the same semester schedule as on-campus classes at ECU. Cameron University offers two associate degrees, two bachelor's degrees and two master's degrees in a totally online format. Additionally, the university has a wide range of programs where much of the required coursework can be completed online, from the Associate of Science in Business, which is 96 percent online, to the Bachelor of Arts in English, where 64 percent of the work can be covered online. Fully online options are the Associate of Applied Science in Criminal Justice, the Associate in Science in Interdisciplinary Studies, Bachelor of Science in Criminal Justice, Bachelor of Science in Interdisciplinary Studies, MBA, and Master of Science in Organizational Leadership. Cameron University maintains testing facilities in the area where online students can take proctored exams, although students who live more than 30 miles from campus must make their own arrangements for proctoring. Online students have access to an IT helpdesk and can access all of the university library's online resources. Students needing full texts of items not online can request that the materials be sent to their home. Oklahoma Wesleyan University offers online programs designed for working adult learners. Both master's and bachelor's degrees are available in business administration and nursing. Online bachelor's programs also include criminal justice, ministry and leadership, and psychology. Graduate students can earn an online mater's in strategic leadership or education. Oklahoma Wesleyan, an evangelical Christian school, sets up its online programs so that students take one course at a time. It also allows students to register for core courses for all upcoming terms at one time and offers a locked-in tuition rate in some cases. Oklahoma Wesleyan was No. 81 Best Regional Universities West in the 2018 U.S. News rankings. Northern Oklahoma College has two options for an online associate degree in enterprise development with an emphasis in business administration or general studies. With either emphasis, students can select to pursue an Associate in Science or Associate in Arts degree. These are flexible degrees with classes that reflect the competencies employers are looking for. The degrees are part of Oklahoma's Reach Higher Initiative, which prepares students to transfer to a four-year school. Courses are delivered by a consortium of Oklahoma community colleges, and every general education course is available every semester from at least one of the participating colleges, with all credits guaranteed to transfer between schools. Northwestern Oklahoma State University offers online degree-completion programs in nursing and business. The nursing program is an RN to BSN program that grants advanced standing to experienced RNs. Nursing students can enroll at the start of any semester, and the program is offered 100 percent online with no need to come to campus. Traditional clinic hours are not required. Applicants must have an associate degree or diploma in nursing with a GPA of 2.5 or higher. Northwestern Oklahoma's online business options are a Bachelor of Science with a major in accounting or business administration and a Bachelor of Applied Arts and Sciences with a major in technical management, which includes an alternative energy option. Applicants who have completed all their general education requirements should be able to complete the program entirely online. The university rotates courses so that all necessary classes are offered online at least once a year. Most of the classes are offered in an asynchronous format, although one senior class requires students to log on at a set time. Most classes follow the 16-week semester schedule, although there are a few eight-week classes. Summer courses generally last for eight weeks. Oral Roberts University has an online learning program designed for adult learners and non-traditional students. Undergrads can earn their bachelor's degree in an accelerated format by taking two online classes each seven-week session. Classes are offered all year long, with two terms each in the fall, spring, and summer. Students may enroll in the program before the start of any seven-week session. Bachelor's degrees available online include business administration, biblical literature, Christian caregiving and counseling, church ministries, government, information technology, international business and ministry, leadership studies, liberal studies, management, psychology, and communication. The college also has an on online program for RNs who want to complete work towards a Bachelor of Science in Nursing. Oral Roberts also offers an online Leadership MBA, which is delivered 100 percent online in an asynchronous format. The MBA program follows a cohort model so students develop a support network with their peers. Online students at ORU are eligible for financial aid, but the university does not offer any scholarships for any of its online programs. Southern Nazarene University offers 100-percent online bachelor's degree-completion programs and master's degrees. Courses are delivered in five-week or six-week modules, and they are asynchronous so that students can perform classwork around their personal schedules. Many of the programs offer multiple start dates throughout the year. Online students have access to technical support and academic support. Undergraduate online students at Southern Nazarene can earn a bachelor's degree in business administration, organizational leadership, or network management. Students in the network management program can prepare for a variety of industry certificates as part of their studies. The online MBA program offers both a generalist track and a health care administration track. Each MBA program requires 40 credits, and students take the courses in a prescribed sequence that they can complete in 22 months. The Master of Arts in Sport Management and Administration is offered in a 100 percent online format. Students must complete 12 courses for 36 credits, and students can earn the degree in about a year and a half. The University of Tulsa is home to three online master's programs, one in business and two in law and policy. The Master of Energy Business is an online program designed for individuals who are already working in the energy sector and who want to prepare for managerial positions. Students in the M.E.B. program must attend two residency seminars that are scheduled for long weekends, either in Tulsa, Oklahoma, or another energy center. The rest of the coursework is delivered online. The program is designed for part-time students, who can complete the 34 credits required in two years. Applicants should have an undergraduate degree in a related field, such as engineering or business, and at least two years of professional experience. The University of Tulsa College of Law offers two online graduate degrees in law and policy that are designed for non-lawyers. The options are Master of Jurisprudence in Energy Law and Master of Jurisprudence in Indian Law. Students may pursue either degree on a full-time or part-time basis, and candidates can complete the degree in about two years. Oklahoma Christian University has an online bachelor degree-completion program for nurses and an MBA program that can be completed online. The MBA program offers eight specialty tracks: accounting, finance, health services management, human services, international business, leadership and organizational development, marketing, and project management. Students have the option of receiving a general MBA instead of specializing. The MBA program is open to students with a bachelor's degree in any field, although students who did not study business as an undergraduate must take preparatory courses in economic and quantitative analysis, marketing and the legal environment, accounting and financial resources, and organizational and operations management. Most students can complete the degree in one to two years. Oklahoma Christian's degree-completion program for working nurses with a diploma or associate degree in nursing leads to a Bachelor of Science in Nursing. Classes are offered in an eight-week format, and students can take one or two classes per term. Students can gain academic credit for some life experiences. Online students at Oklahoma Christian have access to an IT helpdesk, online library resources, and career services. At first glance, Oklahoma isn’t as packed with virtual higher education options as other states. But money-saving initiatives and program options are there, waiting to be discovered. And we’ve uncovered them. We’ll explain where to find a ton of online degrees and courses in one place, how to complete an online degree if you have prior coursework, and where to get tuition-free college credit while you’re still in secondary school. We’ll also unveil our list of the state’s most affordable colleges as well as inform you of schools with shaky accreditation status. Want more choice? Oklahoma is one of 15 states participating in the Southern Regional Education Board (SREB) Electronic Campus. SREB maintains an online program & course catalog, so it’s easy to see what’s available. Use the Electronic Campus to find cheaper programs across the South. Any program labelled “E” charges the electronic rate, which is the same for all students regardless of their residency. A similar SREB initiative — the Academic Common Market-Electronic Campus (ACM-EC) — lets you pay in-state tuition for specific out-of-state degrees not available in Oklahoma. To take advantage of the lower tuition, you must be admitted to the university and get certified as an Oklahoma resident. Read the instructions on the website. Are you an adult with a bunch of coursework to your name but no degree to show for it? Reach Higher, the state’s degree completion program, may be able to help. Apply for admission to one of 14 community colleges or eight public universities, transfer in earned credits, and then work toward finishing your degree. You have two options: a two-year degree in Enterprise Development or a Bachelor of Science in Organizational Leadership. There are five class start dates per year and each class is eight weeks long; the accelerated pace means you can finish quickly. Plus, to increase flexibility, the participating schools have placed many courses online. At some schools, you can take most of the program online, whereas others skew toward evening and weekend work. To help you out, we’ve pointed out the schools on our list that offer Reach Higher degrees and noted which learning format they take. Oklahoma must be doing something right. Several public universities met our criteria for quality, flexibility, cost and financial aid. (See the CAG Score next to the school’s profile in the rankings.) To see how these schools stack up against others in the state, visit College Scorecard, a government website that lets you compare graduation rates, costs and earnings potential. OCampus links prospective students to OSU’s online degree and certificate options as well as an online course search tool. (Remember to filter for online or hybrid classes.) Virtual students can take advantage of many of the same resources as their on-campus peers, including free writing and math tutoring. Of course, they have to pay for their studies just like traditional students do. The Office of the Bursar spells out tuition and fees while the Financial Aid Office works with students to lower the net cost. The Center for eLearning and Continuing Education is your portal to UCO’s online course catalog as well as info about self-paced online courses (SPOC) that allow flexibility. Since UCO doesn’t do fully online programs, you’ll have to register as a traditional student and pay according to the established tuition and fee schedule. Financial aid is available, even for self-paced coursework. But what about higher education outside the traditional ages? UCO’s got you covered. Juniors and seniors in high school may receive a tuition waiver if they pursue concurrent enrollment at UCO, though this does not apply toward flex-ed (SPOC). On the other end of the educational spectrum, adult learners can enroll in the BS in Organizational Leadership program, which is part of the Reach Higher initiative. Not all courses are online, but even the “traditional” courses are offered at times and in formats that maximize accessibility for working adults. OU Outreach is the place to find the school’s online degrees. Follow the links to the College of Liberal Studies to access tuition, scholarship and financial aid info. There, you’ll discover that nonresident military and homeland security law enforcement personnel can get a tuition waiver that brings the cost down to the same rate as Oklahomans. For individual courses, search the catalog. OU has a couple of other options if financial aid eligibility isn’t a deal breaker. One is its online self-paced courses. They aren’t eligible for financial aid, but nonresidents can take them at the in-state rate. The other is online career training. OU maintains a catalog of 1,000+ individually priced career training courses/programs. The Higher Learning Commission (HLC) is the regional accrediting body for Oklahoma colleges and universities. HLC accreditation is desirable for two simple reasons: Students at HLC-accredited institutions are eligible for federal financial aid and can usually transfer their credits to other schools (even if they only count as electives). You can see all the current and former HLC institutions in Oklahoma on the HLC website. On the HLC website click on any “Public Disclosure Notices.” In short, these explain any negative actions the HLC has taken against a school and what the school must do to avoid losing its accreditation status. Many career colleges opt for national accreditation. Going this route allows their students to apply for federal financial aid. However, many regionally accredited schools don’t accept credits from nationally accredited ones, so take caution if your academic plan involves transferring. For a full list of all regionally and nationally accredited institutions, check the Council for Higher Education Accreditation (CHEA) Database. For-profit DeVry is accredited by the Higher Learning Commission, but that status can always change. In 2016, the Federal Trade Commission sued DeVry for misleading advertising relating to graduate employment and income claims. Later that year, the Higher Learning Commission, while not taking direct disciplinary action against the university, did request information related to the FTC’s claims, according to a public disclosure notice. Heartland, which offers correspondence courses through its extension studies department, states that it chooses not to seek accreditation for religious reasons. Therefore, it is not in the CHEA database or on College Scorecard. Southern Association of Colleges and Schools Commission on Colleges (SACSCOC): Call it SACS for short. SACS is the regional accreditor for the Sooner State’s colleges and universities. Oklahoma State Department of Education: Mostly, the agency handles standard K-12 issues, but you may want to look at its list of the state’s public virtual charter schools. Oklahoma State Regents for Higher Education: Go to the student section to learn more about the Reach Higher adult degree completion program. You can also find out about tuition waivers for high schoolers who concurrently enroll in college courses. One more note: The course equivalency tables are essential for transfer students. Southern Regional Education Board (SREB) Electronic Campus: See all the same degrees and courses from the Online College of Oklahoma plus those from 14 other Southern states. If you’re coming from out of state, you’ll be able to see which ones don’t charge nonresidents extra.